45,000 fans made plenty of noise around the tree-lined inclines of Villars sous Ecot in western France for the second atmospheric Grand Prix in a row for the FIM. The hills of the Maggiora circuit provided the first mud race of the 2015 FIM Motocross World Championship as the Grand Prix of Italy was hit by thunderstorms and heavy rain yesterday. On a slippery and technical stage Monster Energy Dixon Racing Team Kawasaki’s Max Anstie pushed through the ruts and bumps to take sixth position overall. The Brit attacked a drier and faster hard-pack course to run as high as fourth on Saturday but an engine problem meant that he dropped back and failed to finish the Qualification Heat, thus lined up with the 35th pick of slots in the gate for the two thirty minute and two lap Grand Prix motos. The rain created difficult conditions but also presented an opportunity with starts and consistency the key ingredients to ensure a positive overall classification. Anstie faced a handicap with his gate position and through needing to thread through the pack while trying to avoid the waves of roost. In the first outing he rounded the first corner and through the ooze of Maggiora in the second half of the pack and jumped past the finish line on the first lap in eighteenth spot. Anstie then exercised caution through a steady ride. The terrain away from the main racing line was slushy and perilous and this meant a processional affair. 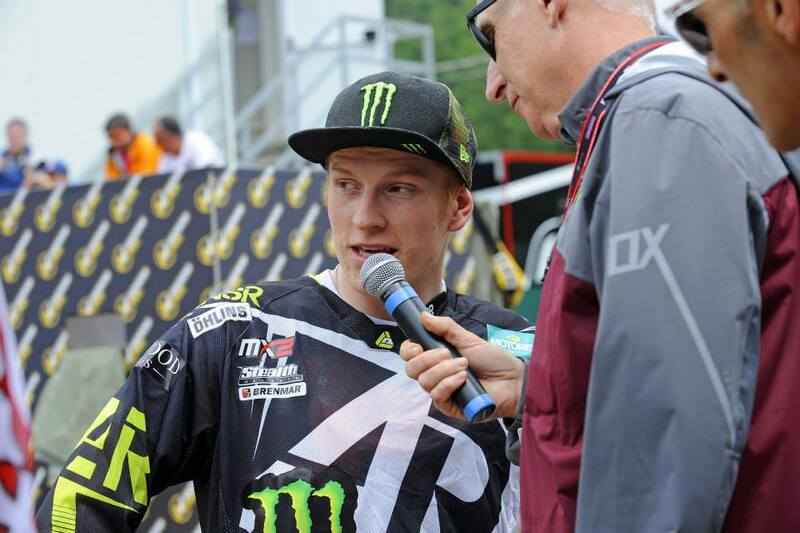 Anstie worked his way to twelfth. The second race took place on a drying and varied terrain, offering more possibilities to the riders. The 2014 Belgian GP winner was able to excel and from a better launch into the top ten kept his head, his handlebars horizontal and made ground to move up to fourth place. ‘99’ harried the back of Jeremy Seewer for third position in the final laps of the race but found the Swiss youngster a stubborn opponent. 210 points for 2015 means that Anstie now sits eighth in the MX2 standings at the halfway mark of the 2015 campaign. Round ten of MXGP will take place next weekend with the hard-pack off-cambers of Teutschenthal set to stage the Grand Prix of Germany. This entry was posted in Home and tagged 2015, bike it, cosworth, fim, italy, kawasaki, maggiora, max anstie, motocross, mx2, steve dixon, youthstream on 15 June 2015 by admin.